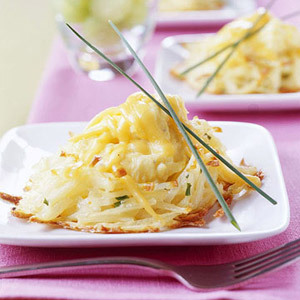 The nests are made with prepared hash brown potatoes, so they're a snap to put together. The filling is simply scramble eggs and chives topped with cheese. A great Easter brunch recipe. Preheat oven to 375 degrees F. Grease a large baking sheet; set aside. In a large bowl, stir together potatoes, the 2 beaten eggs, chives, and the 1/2 teaspoon salt. Shape mixture into 12 mounds (about 1/3 cup each) on prepared baking sheet. Press the back of a tablespoon into each mound, making a nest. Bake for 20 to 25 minutes or until lightly browned and set. Meanwhile, beat together the 12 eggs, milk, the 1/4 teaspoon salt, and pepper with a rotary beater. In a 12-inch skillet, melt butter over medium heat; pour in egg mixture. Cook over medium heat without stirring until mixture begins to set on the bottom and around edge. With a spatula, lift and fold the partially cooked egg mixture so that the uncooked portion flows underneath. Continue cooking over medium heat for 4 to 5 minutes or until egg mixture is cooked through but is still glossy and moist. Remove from heat. Spoon about 1/3 cup of egg mixture into each potato nest. Sprinkle cheese over eggs. Return to oven; bake about 2 minutes or until cheese melts. If desired, garnish with chives. Makes 12 servings.